The recently released Mibew 2 introduces a powerful plugin framework which makes it possible to expand Mibew’s functionality in a myriad of ways only limited by the imagination of third party developers. With events and hooks, developers can expand the live chat service by providing richer client-side experiences, or even backend functionality such as shopping cart or ticketing system integrations. Given that Mibew is a self-hosted solution, website admins will be responsible for acquiring these plugins and installing it on their chat servers. This guide shows how to install a plugin, using the Wurrd client interface plugin and its dependency as an example. The section for updating a plugin is at the bottom of the page. Wurrd is an app that provides a native interface on top of Mibew for operators to interact with website visitors. Extract the Wurrd Authentication zip file. Scenario 1: Installing the first plugin that requires properties. If this is the first plugin you are installing that requires properties, the plugins section will look like this. Modify it to pass the properties that are required. For the Wurrd Auth plugin, the plugins section should look like this. Note that the number of spaces before each line is important. Scenario 2: Adding to a previous plugin that requires properties. Login to the Mibew admin panel and navigate to the plugins configuration page. If the Mibew admin panel is blank, there was an issue when modifying the config.yml file. This is most likely because of indentation of each line wasn’t properly followed. At this stage, your plugin has been successfully installed and it should provide the added functionality to your website. If you are following these instructions to install the plugins for the Wurrd app, follow the same steps above for to install the Wurrd Client Interface plugin. Wurrd Client Interface does not require any plugin properties, so you wouldn’t be modifying the config.yml file. This plugin depends on the Wurrd Auth API plugin, so you must install that one first before installing this. The last step is to clear your cache. If in your config.yml file you are set to use the filesystem for your cache, delete the stash folder in /cache. There are some instances when even after a successful installation of the plugin, some of its components don’t work because the cache has not been refreshed. This bug describes the issue. On your server, make a copy of the old version of the plugin if you need to go back to it. i.e <mibew installation>/plugins/Wurrd/Mibew/Plugin/ClientInterface. Do not make a copy inside the Plugin folder e.g. ClientInterface.backup. Place the copy in outside of <Mibew root> because Mibew scans the Plugin folder for plugins and the backup will cause an error. 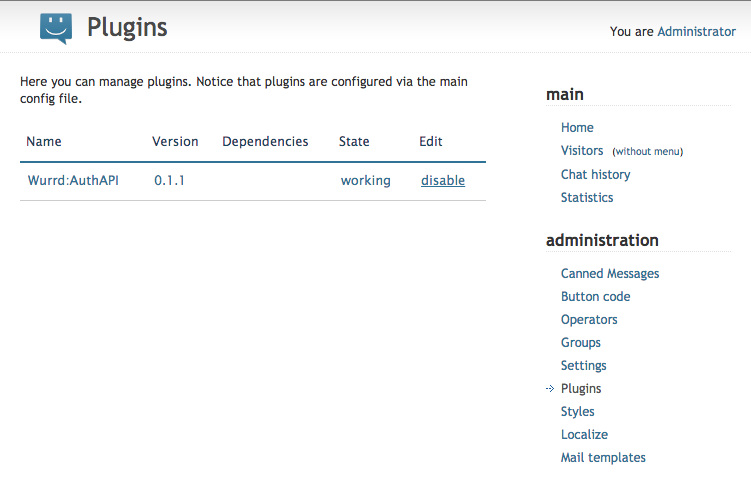 Login to the Mibew admin panel and navigate to the plugins configuration page. The last step is to clear your cache. If in your config.yml file you are set to use the filesystem for your cache, delete the stash folder in /cache. There is a bug in the Mibew core where after an update the cache is not refreshed. We have put together a little script to test your plugin installation located at http://wurrdapp.com/diagnostics/testwurrd.php. We do not save your account credentials, but if you are the paranoid type you can get the script (testwurrd.php) from GitHub and run it from your web server. Sometimes it may be necessary for us to test/debug your server from our test devices. To provide the best support, please be prepared to provide us with access to a test Mibew server. In extreme cases, we have also requested ftp and db access to the test Mibew server. We sometimes have to do this given that Mibew is a self-hosted solution and every environment is slightly different. The Mibew documentation also gives instructions on how to install and update a plugin. Check it out if the steps here are not clear. Olá meu servidor esta desta forma, igualzinho, porém o client no Android não conecta, fica exibindo mensagem unknown error: code = 501 alguém pode me ajudar? Where do we find the client_id, that is referenced in the sample config code above? Hello Sherri, the client_id config has been removed as of AuthAPI version 0.1.3. The plugin can be installed and used without modifying the plugin config section. Plugin “Wurrd:AuthAPI” cannot be enabled. 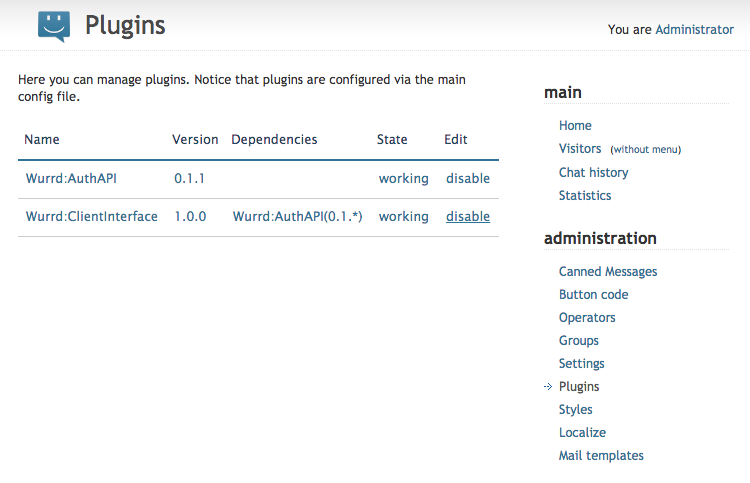 What version of the Wurrd Auth plugin are you using? Version 0.1.3 does not require any changes to the config.yml file. You mean, just upload can be enabled directly, do not edit the CONFIG.YML file? Is it a path problem? yes? thank you very mach! I haven’t used Nginx before but I don’t think that should matter given that Mibew core already works with your setup. There should be error messages in your php error log. 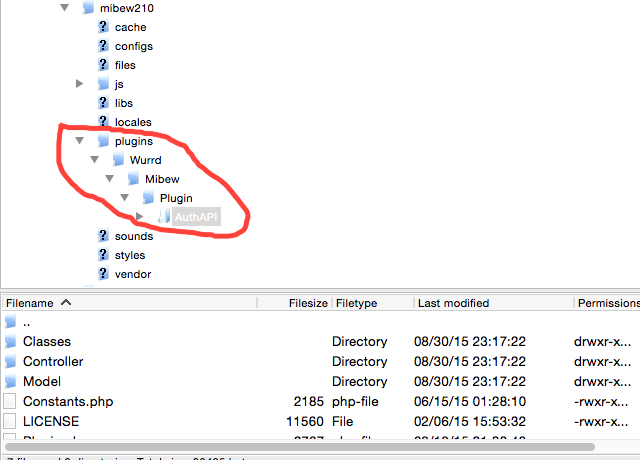 If you are using shared hosting you may find this in a file like “error_log” at the root of your mibew installation. If you are using your own server setup (which I think is what you have with LNMP), you should look for something like php.log in the logs directory. On there you should find information as to why enabling the plugin is failing. i have tried the demo and it works fine and the button switch to online after login with wurrdApp . Am i missing any settings that cause this issue ? Given your test results it seems as if your server is configured properly. 1 – What device are you using? 2 – If Android, do you have access to the Google Play Store? 3 – Is your server running on HTTPS (SSL)? Contact us via private email at info@wurrdapp.com and we will go from there. My site uses ssl and is worling for mibew and other applications. Any idea on where to look for issues to resolve? Hello Thomas, when entering the url did you put the https:// in front of it? The app currently cannot redirect from http to https. If this doesn’t work for you please send us private email at info@wurrdapp.com so we can help you track down the issue. I finally get it to work by changing the config to use_http_post: true. I also deleted some addtional certificate files I had on the server. Not sure what did the trick.